Thanks to the optomechanical coupling, several novel phenomena have been observed such as laser cooling when thermal agitation in the sample is reduced under the application of a photon flux. A physicist from the team “Nanostructures and Quantum Systems” at the INSP recently demonstrated the importance of an alternative coupling mechanism in the context of optomechanics. This is the photoelastic coupling between acoustic phonons and photons which reflects the refractive index modulation in the resonator in the presence of strain fields associated to the acoustic wave. When the photon wavelength is approaching the exciton one in the optomechanical semiconductor compound, the photon and the exciton strongly couple and form a new mixed particle, the polariton and the coupling with acoustic phonons is considerably enhanced as compared to the non resonant situation. Using a Raman/Brillouin set up with high resolution and high stability, we quantitatively determined the scattering cross section of excitonic polaritons though acoustic waves, which directly reflects the amplitude of the photoelastic coupling. We performed systematic measurements as a function of the detuning between the incident photon energy and the exciton one for a large series of temperatures ranging between 30 and 300K. We studied a multi-quantum well (MQW) made of the periodic stack of several GaAs quantum wells separated by AlAs barriers. Using MQWs instead of bulk GaAs allows benefiting of several advantages in measuring photoelastic resonances. 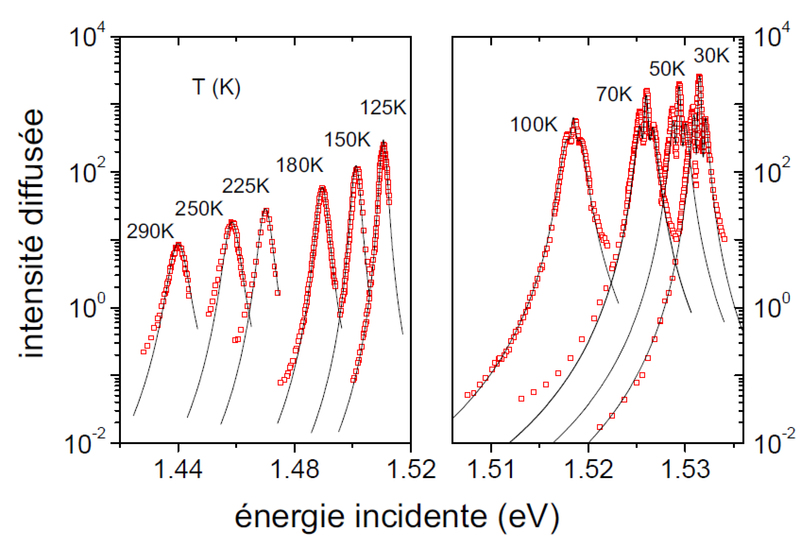 Indeed, the excitons are not coupled from well to well. Moreover, acoustic properties being periodically modulated in a MQW, phonons with wavevectors shifted by a multiple of the reciprocal vector associated to the staking period become active for light scattering and the scattering properties of these “folded phonons” are more easily accessible experimentally. 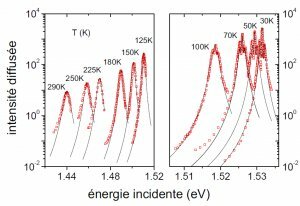 Finally, the polaritonic resonances are significantly enhanced as compared to bulk GaAs because of the increased stability of excitons against thermal damping. 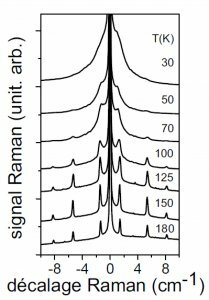 We illustrate our experimental results in Figure 1 in which a resonant Raman spectrum is shown for different temperatures. One observes in each spectrum several lines on both sides of the strong laser line which is taken as the origin of the energies. These lines correspond to the creation or the annihilation of a folded acoustic phonon according to their energy either below or above the incident laser one. The measured spectra strongly vary with temperature and incident energy, a result perfectly reproduced by a new theoretical description of the resonant light scattering process which we introduced for this purpose. Though not visible in Figure 1 in which our measured spectra have been normalized for clarity, the most important observation is the huge variation of the line intensities as a function of the experimental conditions. 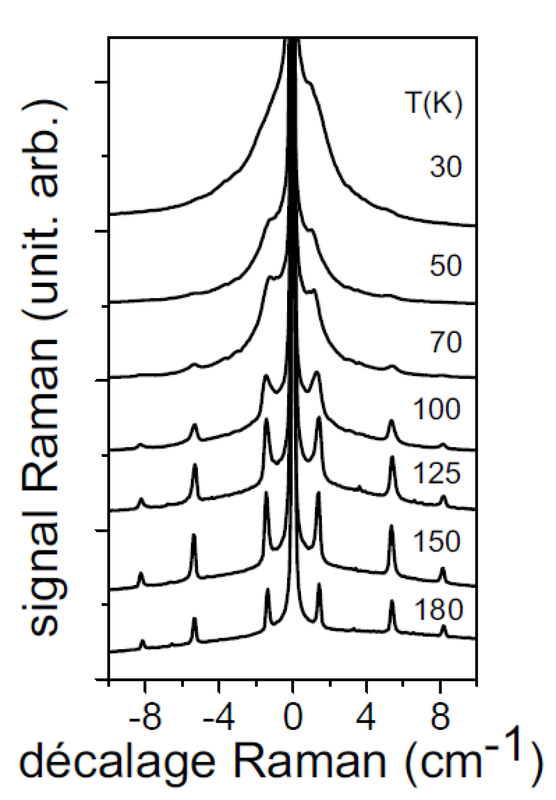 In figure 2, the intensity variation of one of the Raman/Brillouin lines shown in Figure 1 is plotted as a function of the incident energy for all measured temperatures. The vertical logarithmic scale illustrates the variation by several orders of magnitude of this intensity with experimental parameters. Adjusting the few parameters included in our model to fit each series of measurements appeared to be very successful (see black full lines in the figure). This fit provides a quantitative determination of the coupling constant g0 currently used by the optomechanics community. It describes the electromagnetic fluctuations amplitude associated to thermal motion in the resonator and provides an estimation of the minimum vibrationnal amplitude accessible to an optical measurement. We deduced from our measurements a resonant g0 value reaching 100 GHz at low temperature. This corresponds to five order of magnitude above the typical value obtained within the radiative pressure mechanism, the only surviving for photon energies well below the absorption edge of the sample. This result offers new perspectives for high sensitivity optomechanical measurements. It also gives a strong support to recent proposals towards a novel polariton optomechanics. We proposed the use of multi-quantum wells as an excellent active material within cavity nanoresonators, allowing both fully benefiting of the large polaritonic resonance and ideally combining strong optomechanical coupling and high cavity quality factors. Measured scattered intensity variation plotted as a function of the incident laser energy for a Raman/Brillouin line associated to the lowest energy folded longitudinal acoustic vibration. The measurement are presented (open red squares) for different temperatures ranging from 30 to 300 K. The vertical logarithmic scale reflects the several orders of magnitude variations of this quantity with experimental parameters. This result offers new perspectives for high sensitivity optomechanical measurements. It also gives a strong support to recent proposals towards a novel polariton optomechanics. We proposed the use of multi-quantum wells as an excellent active material within cavity nanoresonators, allowing both fully benefiting of the large polaritonic resonance and ideally combining strong optomechanical coupling and high cavity quality factors.